James Bond film franchise has been 50 years and everyone is still hooked with the box office movie. It has been starred by different actors in different generations but the style and charisma of bond is still the same. James Bond has been an icon for a long time not just because of his action moves but also because of his stylish look that everyone wants to have. If you want to let your inner James Bond, try to look at below on how to copy his iconic style. Bond is known for his manliness and how he carries his tux with an elegance. He wears tux that give his torso a perfect V-shape since this style makes the shoulder broader. James pairs his tux with a white shirt and a good pair of shoes and usually he puts on dark tux that fits his body to make it more elegant. Remember that when you wear tux make it look like it’s your own and not anybody else, in other words wear it with confidence. If not wearing tux then Bond is rocking a grey suit. This kind of suit is a classic, he pairs it with his black shoes and sunglasses on. You should have the cut that suits your body so it will look more appealing. If you wanna have that James Bond style then you cant wear your tuxes and suits buttoned down. You got to have a neutral shirts with a fine French cuff and Turnback cuff. You’ll notice in Bond’s jacket on how clean his cuffs are done. Button holes should be aligned correctly, do not overlap it. Attach cuff links and make sure the links complements your suit and the color of your shirt. Most common formal style is called the single cuff and there’s no need to fold it back. Known as cocktail cuffs so you don’t need cuff links since buttons can hold your sleeve. You can have this style in events that doesn’t required a tux. Turnedback cuffs are often called the James Bond cuff. The cuffs have 3 different cuts square, rounded and angled. So it depends on how you want your cuffs will look like. When it comes to shirt, Bond wears clean and well fitted white shirts. He often pairs this with his suits and if he wants to go casual, he wears some colored shirts. He matches this with his pants and shoes and finishes it with sunglasses. The casual look for each James Bond character is different. Even if they wear sweaters the styles are not the same just like pairing the clothing by some khaki pants, shirt and underneath just like how Pierce Brosnan did in Goldeneye. However if you want to be noticed like Bond then you could totally try wearing it with a black tie. You can also add some accessories like hats and watch. In some Bond movies we have seen James wearing a coat especially in a chilly weather. There’s a bit of fiminity when wearing one but still masculine and elegant enough. 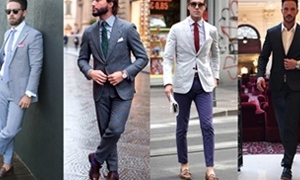 Don’t be afraid to be on trend and rock the coat with your shirt, pants, necktie and a nice pair of shoes. Watches say a lot about the person who’s wearing it. In the movie, James wore different kinds of luxurious watches, whether they appear shortly just like Seiko and Tag Heuer. Omega and Rolex are the favorite of 007, these brands have been seen in most movies. However it is not important if you use Rolex or Omega since watches has that kind of magic that boost someone’s confidence. Bond completes his get up by pairing his outfit the right shoe. He’s commonly seen wearing a pair of black shiny Oxfords. Black color is the easiest option since it goes along with everything. He has also worn shoes from Brogues, Plain Derby Shoes, and Monk Shoes. You can also go for a simple thin laced up leather shoes with a defined heel. When you want to accessorized like Bond you can choose some aviators sunglasses from Tom Ford as what has seen in the movie. He has also different styles of it from sizes to colors. You just have too choose what complements your face shape. You’ll look more like James Bond if you wear this sunglasses with your suits. How many James Bond Films are there?